This stroller is made from over 99% recycled materials (yes, really! ), and it has incredible versatility. 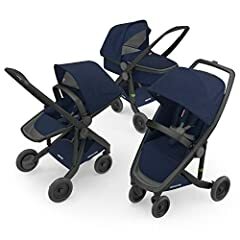 The basic model comes with a regular stroller seat, but you can buy a seat that’s reversible or a bassinet to use from birth. Also because it’s all plastic, it only weighs 15 lbs.